We learn this morning that Permanent TSB has finally awarded the contact for the asset management of a portfolio of €2bn loans relating to Irish commercial property located across the nation. The contact has gone to an agency. And before you ask why is the stilted language above being used in this blogpost, it is because the obvious candidate to take over the asset management of property loans is NAMA, which we own, which we have spent vast amounts of money and time setting up and whose profits, if any, will entirely come back to the State. So which company did PTSB chose to asset manage its €2bn commercial property loanbook? Certus won’t be providing its asset management services free of charge of course, and it will hope to generate a nice little profit on asset managing the €2bn of loans. Why was NAMA not used? Well, when it was first announced that PTSB was tendering for the service last October 2012, the Sinn Fein finance spokesperson Pearse Doherty posed a series of parliamentary questions to Minister for Finance Michael Noonan. We got the usual gibberish in response. PTSB is not a NAMA participating institution – well designate it as one. The State owns 99.5% of it for chrissakes. The €2bn of property loans are not “land and development” – (a) NAMA can acquire any systemically important loans and it swore blind in the Paddy McKillen case in Dublin’s High Court that even if Paddy’s loans weren’t development, they were still systemic because they came to about €2bn (b) NAMA is already asset managing bucketloads of property that is not “land and development”. What were One Warrington Place, the €800m Maybourne hotel loans, 107 Cheapside, the Morrison Hotel, 22-25 Finsbury Square, Updown Court, the Smurfit Kappa offices in Clonskeagh, the Montevetro Building, 1 King William Street and countless others – they’re not “land and development”, that’s for sure. So, yet more gibberish from the finance minister and meantime, NAMA loses out on whatever profit would be generated by the contract that PTSB now has with Certus. The expression “you don’t buy a dog and bark yourself” just doesn’t do this latest goof justice. These are the complete parliamentary questions and responses from 23rd October 2012. Deputy Pearse Doherty: To ask the Minister for Finance further to a report in a national newspaper that 99.5% state-owned Permanent TSB is considering entering into a loan management contract with a private-sector company (details supplied) for the management of €2bn of commercial property development loans, the reason PTSB is not a National Asset Management Agency participating Institution, the reason these loans were not transferred to NAMA in 2010 and the reason these €2bn loans are not being transferred to NAMA now. Deputy Pearse Doherty: To ask the Minister for Finance further to a report in a national newspaper that 99.5% State-owned Permanent TSB is considering entering into a loan management contract with a private-sector company (details supplied) for the management of €2bn of commercial property development loans if he will provide an estimate of the fees that will be paid by PTSB to the company over the proposed life of the loan management contract..
Deputy Pearse Doherty: To ask the Minister for Finance if he wil provide an assessment of the effect of the National Asset Management Agency acquiring €2bn of commercial property development loans from Permanent TSB, the management of which loans PTSB is reportedly contracting out to a company (details supplied). Minister for Finance, Michael Noonan: I propose to take questions 162, 163 and 165 together. Permanent TSB confirms that a tendering process is underway in relation to third party servicing of its portfolio of commercial property loans and that the party referred to is among the parties that the bank has spoken to in this regard. The bank has not completed the tendering process, nor has it signed a contract with any party in this regard and even if such a contract is signed in the future the bank has confirmed that the fees would not be publically disclosed as they would be commercially sensitive. As the Deputy will be aware Permanent TSB is not a participating institution under the NAMA Act 2009 as it did not make an application for such a designation. As a result none of its commercial property loans were acquired by NAMA in 2010. The Deputy will also be aware that only Land and Development loans in the participating institutions were acquired by NAMA from those institutions. The NAMA Act does not allow for a scenario where NAMA would service assets which have not been acquired by it. Permanent TSB is not currently selling its commercial property loan assets and therefore an analysis of the impact of an acquisition of Permanent TSB’s commercial property loans by NAMA would have limited value. 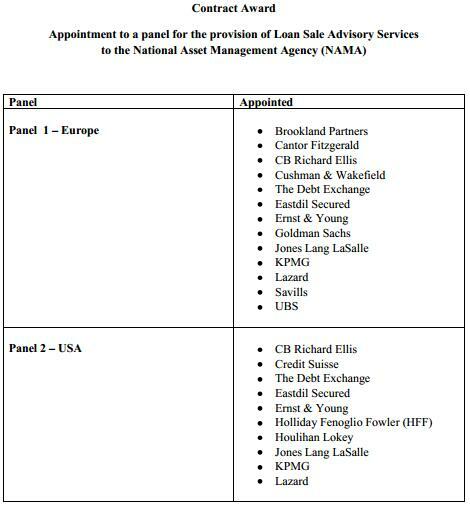 It was in November 2011 that NAMA appointed two panels of a total of 23 advisers to assist the Agency with selling loans. As we know, NAMA has to date sold €2.4bn of loans but it is understood most of these were sold before the start of 2012. And guess what? The panels of advisers are getting antsy about (a) the lack of business coming their way from NAMA and (b) the fees NAMA is willing to pay for their services. Some of the advisers have unburdened themselves on Sandrine Bradley at the International Financial Review. The poor dears are unhappy with the slowness of NAMA’s loan disposals and of “the NAMA exit strategy” and of course the “commercial terms were not acceptable” or in other words, NAMA isn’t offering them what they consider appropriate fees. And when they are asked to tender for a specific loan disposal, they don’t get much feedback from NAMA if they’re not successful. Needless to say, such comments cited in the article are unattributed. Two companies that did go on the record are more mollified in their comments. Jones Lang LaSalle which recently sold €21m of loans relating to Paddy Kelly’s Hotel Phoenicia in Malta says “There is now actually an oversupply of capital in Ireland looking for scarce opportunities. From a pricing perspective it is a good time to sell and NAMA is probably looking to capitalise on this level of demand” Deloitte helpfully chip in with their there-there saying that NAMA is working to get to grips with its portfolio. It was recently leaked/reported that NAMA is lining up two loan portfolios for sale, €800m relating to what are understood to be David Courtney’s loan connections and between €230-350m depending on sources, of what are understood to be Eamonn Duignan’s loan connections. Ireland is experiencing a loan sale boom at present, discussed here. NAMA was contacted by the International Financial Review for comment and rejected the criticism and pointed to its €4bn of asset disposals last year. “I remind Deputies and the Minister that we have a programme to complete which involves five priority questions in 30 minutes. We are now well over the time allotted to these questions. We either conduct this session in accordance with the rules and protocols or it becomes a free-for-all. What do Members want? Please help me to do my job” Fine Gael Deputy Peter Mathews who acted as “chairman” on Tuesday this week during questions in the Dail. The man who is nationally famous for his lengthily-parsed (being kind) or long-winded (being less kind) speeches, and who is constantly criticized by the chairman of the finance committee for over-running his allotted time to ask questions – was put in the role of managing the time of others this week. Yes, on Tuesday, you might have felt that your eyes were deceiving you as Peter Mathews took over the role of Ceann Comhairle, but no, a panel of temporary chairpersons is established at the start of every new Dail to assist the Ceann Comhairle and Leas Cheann Comhairle with the business of the House. Such appointments are governed by standing order 16. It was almost as if someone was taking revenge on the Deputy who finds managing his own time notoriously difficult. Deputy Mathews made the news this week also after he attended the non-politically aligned Ballyhea 100 protest and talk last weekend, where up to 400 people turned up to hear about the protest that started in Ballyhea but which is now being replicated in Ratoath and Wicklow. Northern Ireland’s economy is measured for the first time separate to that of the rest of the UK. 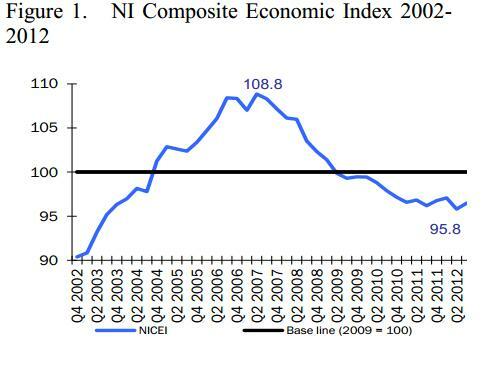 During the week, the Arlene Foster’s industrious Department of Enterprise Trade and Investment produced a new statistical series which maps out an index for the Northern Ireland economy (it has a GDP of about €35bn). 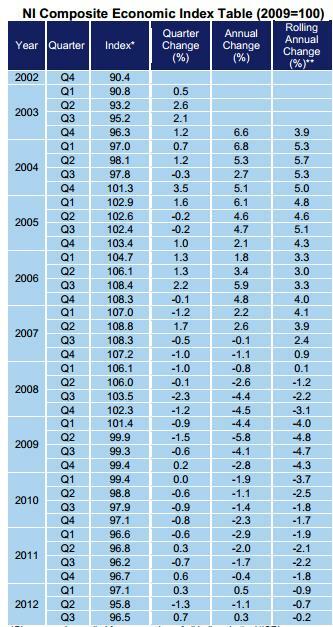 Further information is being sought on the series, but for the time being, it appears to show real GDP declining by 11.3% from peak in 2007, compared with just 2.9% for the UK generally and 6.7% in the Republic. Deputy Maureen O’Sullivan: if he will have cause to have laid before the Houses of the Oireachtas a schedule of all artworks to have come into the possession of the National Assets Management Agency since the establishment of the agency; and if he will make a statement on the matter. Minister for Finance, Michael Noonan: I am advised by NAMA that the information sought by the Deputy is of a commercial nature and that its disclosure would potentially place NAMA at a commercial disadvantage. I am advised accordingly by NAMA that it is precluded from providing the information. This week, RTE launched a new morning TV show “Morning Edition”, a mix of current affairs, regional news and entertainment. 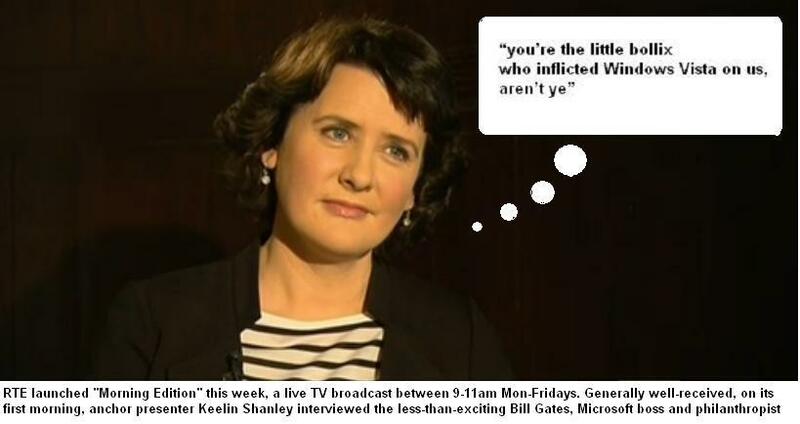 The show broadcasts between 9-11am Monday to Friday, and on its first morning, it featured an interview between the ever-smiling Keelin Shanley and Microsoft founder and philanthropist Bill Gates, a Colossus of a man, but hardly the most entertaining in a morning TV show. The show signals RTE’s commitment to current affairs, and who knows, it may well blossom into a much-needed news source. You can watch last week’s shows on the RTE Player here. (1) What is the name of the Polish company or companies which allegedly provided the horsemeat, and was there any Irish interest in the cold storage unit apparently identified as the source, or the five Polish companies which provided meat to the cold storage unit? Today, Poland is challenging the claim that it is the source of the horsemeat and accuses Ireland of a witch-hunt for commercial gain. (2) Did the food stores, like Tesco and Asda, never wonder how Silvercrest could produce burgers so cheaply? What legal action can be taken by consumers who might have purchased or consumed horsemeat contaminated burgers, and what compensation are they due? (3) How long might consumers have been exposed to horse contaminated meat, and should food stores not be issuing recall or warning advertisements in the national press? (4) Why did ABP source meat in Poland in contravention of agreements with Tesco and Burger King, and perhaps others? Why was management at Silvercrest removed? Was the horsemeat contamination the result of error or fraud or something else? (5) What is the €-value of damage done to the Irish economy by the affair and what legal action can be taken by the State against ABP and others? Tesco has seen €360m wiped off its share price apparently as a result of selling the horsemeat contaminated burgers. (6) Why have Dunnes Stores, Asda, Iceland and Lidl not cancelled their contracts with ABP? (7) What other outlets might have been selling horsemeat-contaminated beef burgers, eg food stores, fast food chains or even your local chippers. 200 million burgers a year were being produced by Silvercrest. Where were the 200m burgers produced last year sold to the public? (8) Why has the Irish media not been “in your face” with ABP, food stores, your local chipper, the Department of Agriculture, the Food Safety Authority and challenging the Polish rejection of accusations that it is the source of the horse contaminated meat. Out of curiosity I took a look at the packaging on one of Iceland’s beefburger packets in Dublin this week. It was eyebrow raising. The 454g 4-burger €2 packets merely say the burgers contain “Beef 98% Seasoning “ – no percentage for seasoning and no breakdown of the “beef” and there is a list of about six ingredients in “seasoning” – and that the burgers are “produced and packed for Iceland” in the UK. Did the burgers comes from Silvercrest or Dalepak, the ABP plant in Yorkshire? Who knows? But Iceland is one of the stores to which horsemeat contaminated burgers were supplied. The Oireachtas agriculture committee cancelled a hearing with the Food Safety Authority scheduled for 22nd January, 2013 until “a later date where all information appropriate to a discussion with the Committee is available” It will now take place on Tuesday 5th February 2013 at 2pm. Although some newspapers report compliance rates as high as 80%, the truth appears to be that by the 1st February 2013, just 328,206 households met the deadline to register their septic tanks and pay the registration fee, now €50. There are apparently 497,000 homes in the State with their own septic tanks, according to Census 2011, so the compliance rate appears to have been 66%. Unlike the property tax and water charges, the septic tank registration was required by the EU which itself was seeking to protect drinking water by preventing contamination from leaking or faulty septic tanks. But despite the incentives – up to 80% of repairs up to €4,000 for households with income of less than €50,000 – the people have spoken (again).